It’s said that English as a language of the scientifically and technologically more developed world is more logical and accurate than Chinese. But I always argue that it’s not the languages but the people who use them that make them appear so. Actually, languages are by definition not so logical and accurate as some people seem to think. They are used by people and illogical and inaccurate things can very easily happen, even to a great writer and an experienced translator. I start them from the day which succeeded that upon which I had established two facts of great importance, the one that Mrs. Laura Lyons of Coombe Tracey had written to Sir Charles Baskerville and made an appointment with him at the very place and hour that he met his death, the other that the lurking man upon the moor was to be found among the stone huts upon the hillside. Of course, the letter did not say “the night of Garcia’s death” and only said that Scott Eccles would be with him “on that night”. My observations here seem arguably nitpicking, but it certainly points to people’s tendency to use languages not so logically and accurately. Another example was the recent response of the U.S. embassy to China to the atrocities committed on the night of March 1, 2014 in Kunming, Yunnan by some well-trained, knife-wielding, and uniformed Uighur terrorists in black from China’s Xinjiang region. 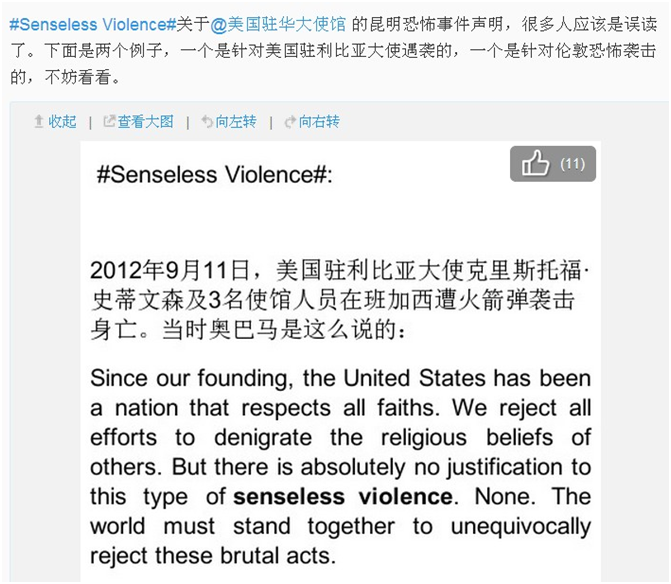 The first sentence (in bold above) caused uproar and strong protests among visitors to the embassy’s Sina Weibo page. 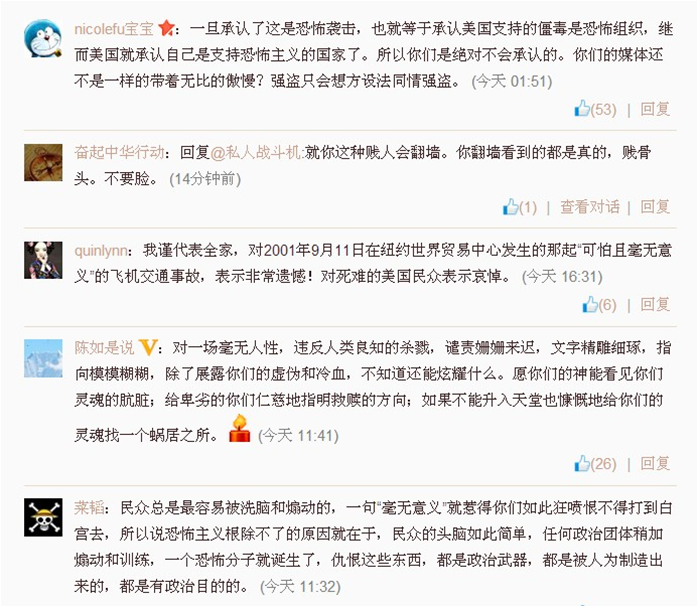 It’s insulting for many of them to find the U.S. embassy still calculating whether the atrocities have 意义 when they’ve already found the indiscriminate killings so ugly and bloody. The embassy seems to say that there is alternatively sensible and legitimate violence that could have happened to the defenseless civilians. What makes it worse is that the embassy conspicuously shows its unwillingness to call the violence acts of terrorism. This angers the visitors who have good reasons to think the U.S. government has all along condoned and subsidized the terrorist and separatist groups in Xinjiang and Tibet. The United States condemns this horrible and senseless violence in Kunming. Not surprisingly, another translator was quick to notice that the American president himself with his Administration uses “senseless violence” to describe the killings suffered by his own people and his Western allies. Nile Gardiner, a Washington-based foreign affairs analyst and political commentator, thinks that the President, in the belief that terrorism is now a “diminishing threat”, hesitates to call them acts of terrorism. It’s simply unacceptable for an American president to describe things like genocide or terrorist attacks on diplomats as “senseless violence.” We need to get to the bottom of this, and quickly. We need to know where President Obama learned this disgusting and offensive rhetoric so we can put an end to it. Fortunately, Google has our answer: President Obama’s thought crime was inspired by some guy named Ronald Reagan. The intended meaning of “senseless violence” is and its soundness builds on the premise that no violence is sensible. But the interpreted meaning of “senseless violence” can be that there is another category of violence that does make sense. 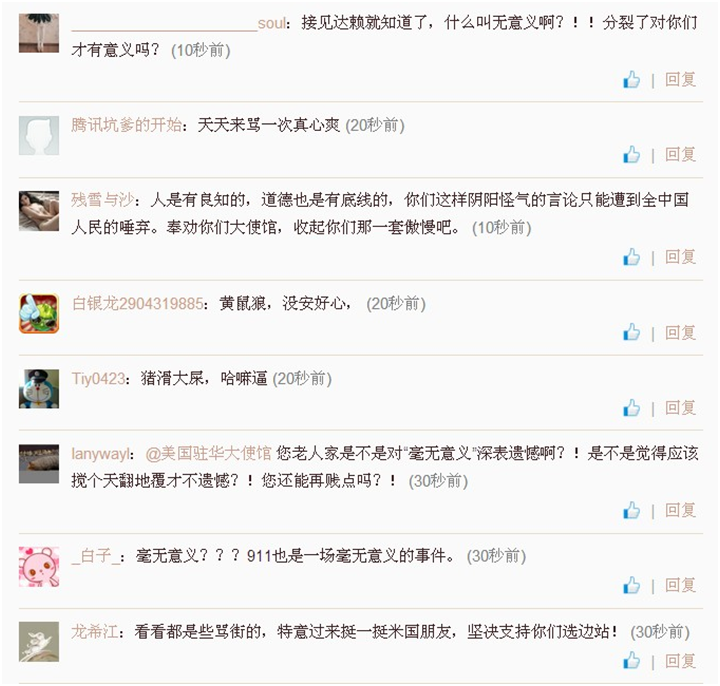 A sensitive brain can easily make of the expression in this way and the ones in China are not alone. When I hear these phrases “senseless violence” and “senseless tragedy” I immediately think of circumstances in which they might be appropriate. When a tornado devastates a small Midwest town calling it a “senseless tragedy” seems appropriate. Likewise, when some person with obvious mental illness opens indiscriminate fire on an unsuspecting crowd, calling the act “senseless violence” seems appropriate as the culprit who perpetrated the violence had no logical end. That is the crux of it, I think. When death ensues from something indiscriminate, whether tornado or mental illness, it can properly be called senseless. It is something that cannot be helped. These things just happen and we cannot make sense of them. However, when violence is planned and or committed with a specific purpose in mind, it is the exact opposite of senseless and to pretend otherwise is reckless. The term is often criticized because it seems to say that the violence which is not categorized as senseless is legitimate. Also, it is difficult, if not impossible, to define what constitutes “senseless violence”. Others point out that the term is or can be misused by right wing politicians who strive for more repressive measures against crimes. These examples are revealing about the ambiguous nature of human languages and we can be very sure that there are many.